< Click on the links (left). Although a manor from Anglo-Saxon times, a town of national industrial significance from the 18th century and Britain's second city after London from the 19th century, Birmingham did not take its present geographical shape until the beginning of the 20th century with the passing of the Greater Birmingham Act in 1911. The ancient manors that make up the modern city had previously been part of the counties of Warwickshire, Worcestershire and Staffordshire. 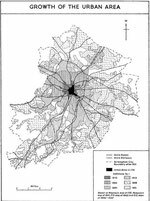 For the map (above) and for further information on the city's development, see British History Online - Victoria County of Warwick Volume 7 The City of Birmingham W B Stephens Ed. 1964 - The Growth of the City. Aston, Birmingham, Edgbaston, Sheldon and Sutton Coldfield (all in Warwickshire) came under the archdeaconry of Coventry, which was transferred from the diocese of Lichfield & Coventry to Worcester in 1837. In 1905 the new Diocese of Birmingham was established taking in the whole of the present metropolitan borough, which now forms about half of the area of the diocese. The remainder consists of Smethwick, a strip round the south and south-west of Birmingham, and a rural area east and north-east of Birmingham which includes Coleshill and stretches from Newton Regis in the north to Lapworth in the south. The diocese is divided into the archdeaconries of Birmingham and Aston, which form roughly its eastern and western halves, and into eleven rural deaneries of which seven are within the City of Birmingham. Birmingham churches account for some two-thirds of the churches in the diocese. A fascinating website is Clergy of the Church of England Database which gives details of the clergy from the Reformation to the mid-19th century. Details of all Birmingham parishes are to be found under the diocese of Coventry & Lichfield or that of Worcester. Use the Search Locations facility. For up-to-date information on the current arrangement of deaneries and parishes go to the Diocese of Birmingham website or The Church of England website. Right: Arms of Birmingham Diocese from Wikipedia.